The most common size of water fire extinguisher is the 9Ltr size. These fire extnguishers are often found by exit doors and also on stairwells. The 9 Ltr Water Fire Extinguisher is suitable for use on class A fires. This means that it is ideal for use on flammable solid fires, such as wood and paper. 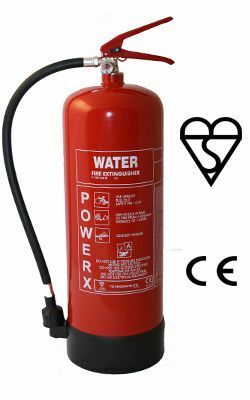 There are several 9Ltr Water Fire Extinguishers within the product range of The Safety Centre with all being suitable for use within the UK. The 9Ltr Water Fire Extinguisher units featured on The Safety Centre are manufactured by Thomas Glover, Gloria and Commander. Each unit comes complete with a hose, wall mounted fixing bracket, safety pin and tamper seal. They are filled, pressurised and ready to be mounted onto the wall in position. The important details to be looking for when selecting a 9Ltr Water Fire Extinguisher is to make sure that they are BSI Kitemarked, CE Marked and BSEN3 approved. These are 3rd party approvals and standards which show that the extinguishers are of suitable quality. Many insurance companies also require extinguishers used in buildings to carry these marks in order for an insurance policy to be valid. If you’re interested in 9Ltr Water Fire Extinguishers you may also be interested in our CO2 Fire Extinguisher and Fire Blanket ranges.